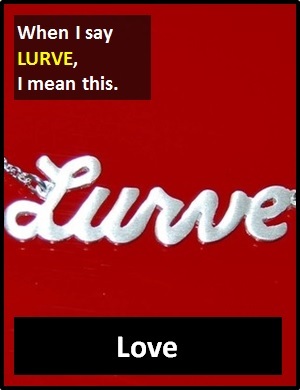 LURVE | What Does LURVE Mean? LURVE may suggest more or less passion than "ordinary" love, depending on the context. It can also be used sarcastically to indicate strong dislike. Of note, LURVE can also be written as LURV. Trevor: I love you Jean. Jean: I LURVE you with all my heart. John: I had to wait 2 hours for the hairdresser today. Ted: Wow. I know how much you LURVE to be kept waiting. We LURVE quiet nights in. They LURVE it when we beat them.